Quality Hotel Accommodation in Glasgow - without breaking your budget! Looking for Budget Hotels in Glasgow? In these difficult economic times, value for money has become an essential feature of any trip for most people who travel, both for professional and for leisure reasons. If you or your company needs budget hotels in Glasgow that don't compromise on quality, you should seriously consider The Sandyford Hotel. The Sandyford Hotel is a 3* establishment, with all the comfort one associates with that standing. We have 55 well-appointed en suite bedrooms which are all tastefully furnished. There is free Wi-Fi access and tea and coffee-making facilities in every room, because we don't believe that budget should mean lacking in modern comfort. Our hotel is very central, within easy reach of Glasgow airport and the M8 motorway. We are located between the West End and the City Centre and within walking distance of the SECC, Scotland's premier conference and exhibition facility. There is also a bus stop just outside the door and the area around Sauchiehall Street is full of interesting places of entertainment, bars and restaurants. Despite this central location, we strive to keep out prices very affordable. As well as being one of the most central budget hotels in Glasgow, The Sandyford Hotel offers a warm welcome to all our visitors any time day or night. Our reception desk is staffed 24 hours a day for your safety, comfort and convenience. We practice budget prices at The Sandyford Hotel, but we are confident that you won't be disappointed by the quality of our bed and breakfast accommodation and the full Scottish breakfast that is included in our B&B prices. Why not give us a call today to discuss your budget Glasgow hotel needs and find out about our best rates for your dates. We will be only too happy to advise you on room availability. We can also be reached through our website, with the online booking enquiry form. 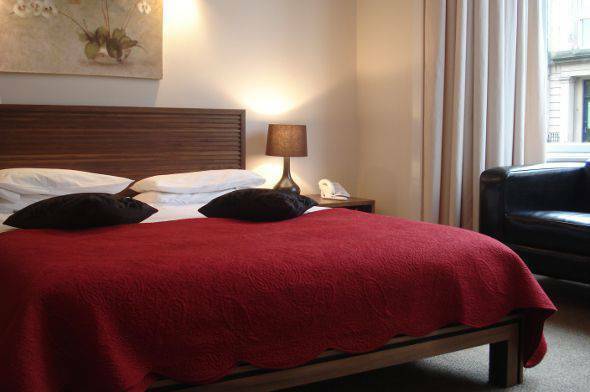 Make The Sandyford Hotel your choice of budget hotel in Glasgow. For more information about the Sandyford Hotel or to make a general booking enquiry, please fill in the "Booking Enquiries" form at the top of this page. You can book online immediately using the "Book Online Now!" box to the right.